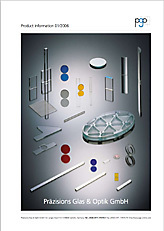 "Technical Glass & Optical Coatings"
The product information of our internet presence is always more up-to-date and complete than they could ever have been in our catalog. Our website is updated almost daily. That is why we have discontinued the publication of our print catalog. Please use our full-text search to search our extensive website for the relevant terms. In case you cannot find what you are looking for please send us your information request.